The Chief Marketing Officer of a large Northeastern health network was vexed. The network had over ten-thousand employees, but nowhere near that many social media followers. The network’s doctors and nurses did a top-notch job of caring for patients. But they didn’t seem to know about their colleagues’ accomplishments. It didn’t matter how many tweets the marketing department sent out- much to the Digital Marketing Director’s dismay. And that’s when the Chief Marketing Officer and the Digital Marketing Director talked to Viddler. We understood their concerns. After all, many new patients find their care provider through word-of-mouth referrals from friends and family. Each of the network’s ten-thousand-plus employees had friends and families. We knew that when these friends and family members sought a new care provider, they consulted the medical professionals in their communities. And so we asked this crucial question. Could the network’s staff help generate new patient referrals just by explaining why they loved their workplace? It was clear the network could use a better solution than a more engaging social media strategy. We suggested building a unique employee advocacy program. It wouldn’t be an easy task. We knew a successful program had to mesh with the network’s existing workplace culture. It also had to recognize that the employees were healthcare professionals whose chief responsibility is to their patients. We worked closely with the network to develop a program that met these conditions- and exceeded everyone’s expectations. This is what we learned, and now offer all of our healthcare clients. In order to build an employee advocacy program that works for your healthcare organization, you need to answer the three Aware-Share-Care questions. How can you best make your employees aware of your organization’s successes and accomplishments? How can you best help your employees share these successes and accomplishments with potential new patients? 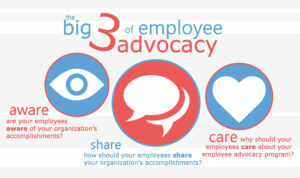 Why should your employees care about your employee advocacy program? 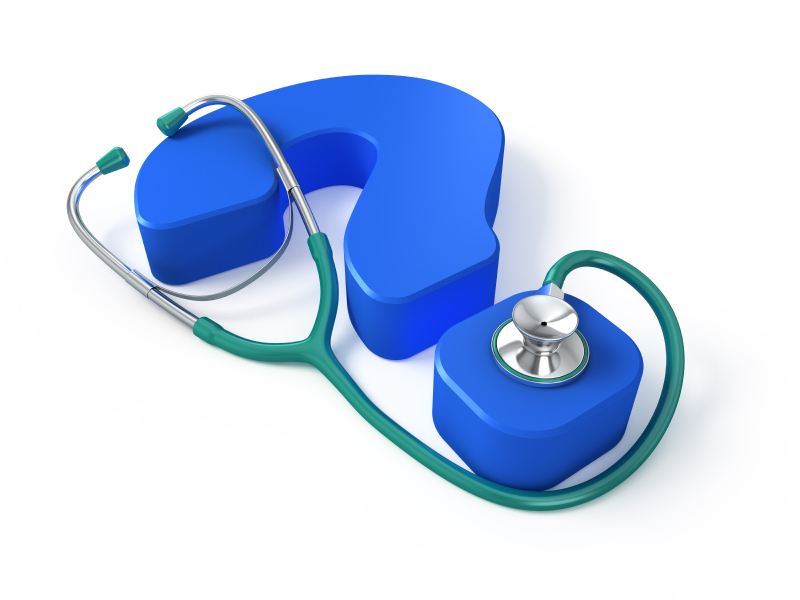 Here’s how we answered those questions for the health network. The Digital Marketing Director was already frustrated that her social media outreach efforts were not effective. Not many of their employees followed their network’s social media accounts. At that moment, Twitter and Facebook were not the right platforms to raise employees’ awareness about the network’s accomplishments. After all, doctors, nurses, and allied health professionals have stressful, often emotionally-draining occupations. It makes sense that network employees might want to keep their work and private lives separate. The network needed a platform that was expressly professional, and easy to access during work hours. That way, employees wouldn’t feel that their work cut into their personal time. Viddler’s unobtrusive video platform provided the network the ability to raise awareness among employees, while still allowing employees to keep work at work. We also built a custom integration so that if, after watching a video on our platform, network employees wanted to share it on their personal social media, they could. All the while, our tracking software made it easy to measure engagement rates. We found that with our platform, more employees watched awareness-building content than ever before. More employees began sharing videos on social media, too. But Twitter and Facebook aren’t how most patients find care providers. We wanted to increase organic patient referrals. Viddler has long-standing expertise in sales training. We know that preparation is vital to good communication. In order for the network’s employees to generate organic patient referrals, they have to be able to remember the details of their network’s success stories and accomplishments. So, when building our employee-advocacy platform, we included the in-player question feature from our training software. These in-player questions helped us track video completion. But they also doubled as practice questions. Each time an employee encountered an in-player question, they also encountered the same type of question a family member or friend may ask about their network. Multiple choice questions reminded employees of the details of network accomplishments and success stories. Short answer questions helped employees articulate in one or two sentences why their network was the best place in the region for a particular kind of surgery or cancer treatment. These videos didn’t just raise employees’ awareness of network accomplishments. They also helped employees remember and articulate why their network was awesome. That way, when an employee had an opportunity to share the best things about their workplace, they were already equipped with facts, details, and stories. The final piece of the employee advocate puzzle is motivation. Any employee advocate program must be internally and externally motivating. The network’s medical professionals were busy. They couldn’t feel as though they had wasted their time by watching our program’s videos. The network’s in-house video production company was spot-on. All the video content they already produced was short, sweet, and informative. The kind of videos network employees wanted to watch. But we still needed to provide external motivation for our program. The Digital Marketing Director had previously spearheaded an employee fitness program with a rewards component. For a certain amount of physical activity performed, employees received health-network-branded merchandise. This program was such a success, that the network’s marketing department was overwhelmed by the effort to send out all the t-shirts to their employees. The Digital Marketing Director knew that a similar rewards component would motivate her network. But fulfillment had been such a headache, she knew she needed a network vendor to help out. We had an easy solution. We sat down with the marketing company that produces the network’s branded merchandise. We built a custom API and hooked up our software to their online store. That way, every time a network employee watched a video on our platform, a certain number of credits were deposited in their account on the marketing company’s online store. If they shared a video on social media, they’d automatically receive even more credits. Network employees could cash in their credits whenever they wanted, for whatever item they wanted. Employees had now more than one reason to care about our program. It’s been over six months since the network introduced our program. The Chief Marketing Officer had hoped 20 percent of network employees would participate in the program. We achieved over 50 percent participation in the first month. That figure has only risen half a year later. Not only that, the Chief Marketing Officer reported a complete ROI after only four patient referrals attributed directly to our program. Posted in Employee Engagement, Healthcare, Marketing and tagged best.